What new and innovative stuff are you doing with content in terms of training folks? Well, probably the most innovative thing we’re working on now is we’re, for our authoring tools, we’re adding the ability to do mobile. Which obviously brings with it a lot of concerns as far as SCORM goes. Right, so what sort of trouble did you run into in that regard? The biggest thing we’re trying to solve in that arena is making it possible to take the course while you’re disconnected and yet still sync your progress with the LMS. You don’t have to be connected while you’re taking the course. That’s the biggest thing. That’s probably the only thing that’s really innovative. Most of the other stuff we do, that involves SCORM, is pretty standard stuff that’s been done for a while. We really don’t do anything with sequencing, that’s just been too difficult to implement so we haven’t really gone down that road. So that’s really the most innovative thing we’re working on right now. What do you want to track about your learners, and then what do your customers ask to track? The stuff we track the most, we do a lot with interaction data, so we do have requests for integrating that better with objectives, for example. You can tie interaction to an objective, but making something more robust, along those lines, and I don’t know exactly what the final picture of that would be, its been talked to me before about ways to link interaction data better to the different objectives in a course. Without knowing the final picture, can you tell me any more about what sort of link is desired? It was probably, more what they’re interested in is on the LMS side of things, so I don’t know how involved SCORM would be in this, it may be more of an LMS thing. What they’re interested in is being able to do a bunch of different courses based on objectives and get interaction data from that. Like an aggregate score for a single objective that may have multiple interactions throughout the course that are tied to that objective. So for example, they could get a report of all the interactions in a particular course, and they can see the objectives that those interactions are tied to, but there’s nothing — and there may be in some LMSs already, but there’s nothing to aggregate anything by objectives. Besides data, what are your customers asking for? Right, one thing that we have been discussing or looking at as a huge implementation for our tools, that has to do with SCORM as well, is starting to provide content for different vertical markets that goes with our tool. But in order to make — we can do it ourselves, but it would be nice to do it with a standard. So let me just give you a picture of what we’re thinking: SCORM has the whole idea of re-use with SCOs, but it hasn’t really caught on a lot. Our perception is that the better way to do that is to make content re-purposeable, so this is what we’re thinking: We provide content, basic content to different verticals — our clients own our tools — but not only do they get that content, but they can open that content up in our tools, and customize it or change it to fit their organization instead of just re-using it. And so that’s why we call it re-purposing as opposed to re-using. We can do this with our own model of creating courses, but we have always thought it would be great if SCORM had a standard for course creation that was, maybe an XML file or something, that defined courses. I don’t know what the standard would be, but if there was a standard than everyone could create content around that standard, and it could be re-purposed with any tool that was built around that standard, that could then open up that content, tweak it to fit the organization they belong to, and then give it to their own people. So that’s something we’ve thought about, we plan to move in that direction once we finish all these other big projects we’re working on. That’s a really big pie in the sky thing! Right, now, do you picture that, have you thought about what that format would look like? You tend to be very Flash-based, right? Do you envision that as something that would be, that there might be a different format that’s more for Flash-based content, or make Flash objects just like any other object within that format, or you would probably be drilling down even within the Flash, right? We perceive the format as being XML, so what delivers that XML content could be Flash, could be HTML 5, could be anything. We don’t think it should be tied to something like Flash because we currently use a lot of XML in our course creation. So the XML really defines the course. And we can put any sort of wrapper around it, it could be a Flash wrapper, an HTML wrapper, something else. That’s how we see it happening. How do your customers want to access the data they track? That’s a good question. I’ve never heard any other requests besides basic reporting. So, I don’t think anyone has ever thought beyond that. I do hear a lot of complaints, that there are never enough reports to get what they want. That probably has more to do with the LMS than with SCORM. If the data’s not there, I guess that could be a SCORM thing? Frequently the data is — sometimes the data isn’t there, like with when people want to track real question-level details, what’s the best way to track what the text of the question is? That’s a huge thing with us. I know there’s a lot of workarounds with that, but if that could be simplified or made better, that would be ideal. 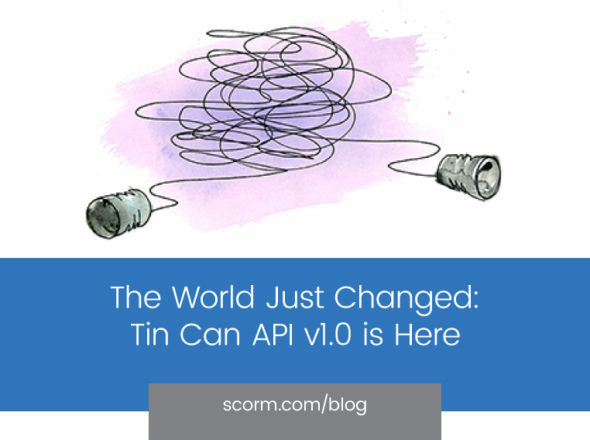 One thing I have in mind when I ask the question how do your customers want to track their data, and I guess the fact that the complaint is there are never enough reports, in my mind, reinforces — what if there was an API, in addition to pushing the SCORM data in, what if there was an API for pulling the data out? That would be good. We’ve even had a couple of customers who have asked us to do some customization that creates what is basically an admin tool. What it does is just hold the SCORM data back and allows them to change it. Is there any feedback you would like to give to the project that there hasn’t been a good question to answer with that feedback? Is there some way to simplify sequencing? We’ve always wanted to use it, but it’s never been practical to use it. That’s the only thing I have left, written down here. The biggest thing we run into with that is that we get customers who want to do what you would use sequencing to do, but because sequencing is so complex, they want us to incorporate it into a single SCO or somehow do it in on the course-level side.